Blogger is one of the top blogging platform. But it has its own limitations. One Big Limitation is that its under control of Google. Google can delete your blog if they want. SO its always good to take backup of your blogger blog. 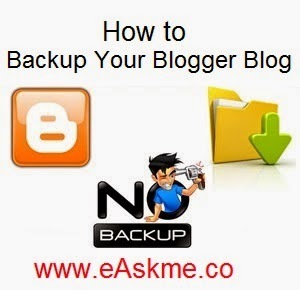 You can easily take backup of your Blogger blog including posts and comments by Export festure of Blogger. It will backup Your Blog In .xml format and you can save it on your PC. Its manual process and you can take backup of your blog weeekly or monthly. How to Backup Your Blogger Blog ? Go to Blog Tools and Click on "Export Blog". Export blog popup will open. Click on "Download Blog" button. It will download your blog in .xml format on your pc. You can take backup regularly.